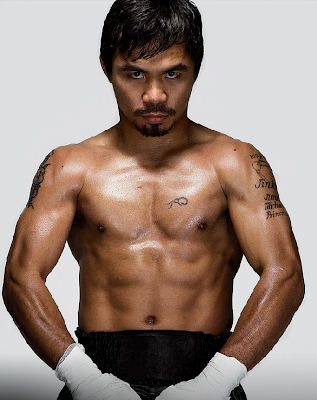 "Manny has two advantages over his opponents: He's in better shape, and he'll take a punch. He averages 3,000 sit-ups and 44 sparring rounds per day; he runs about eight miles every other morning, uphill. I don't know what it is, but there's something inside of him. When he gets hit, he taps his gloves together as if to say, 'Here I come.' He gets after an opponent after he takes a shot, as if he liked it." It's about time we all stepped our game up. Part of ESPN the Magazine's Body Issue. Meant to compete with Sports Illustrated's Swim Suit Issue. Professional athletes sort-of naked.